Oh yes that piece of styrofoam is nailed to the table! I kinda forgot to compare the size of the nail to the height of the styrofoam..... a simple and crucial error. BTW no kid was hurt during this activity although I can't say the same for the table. My smile visibly faded during this project. 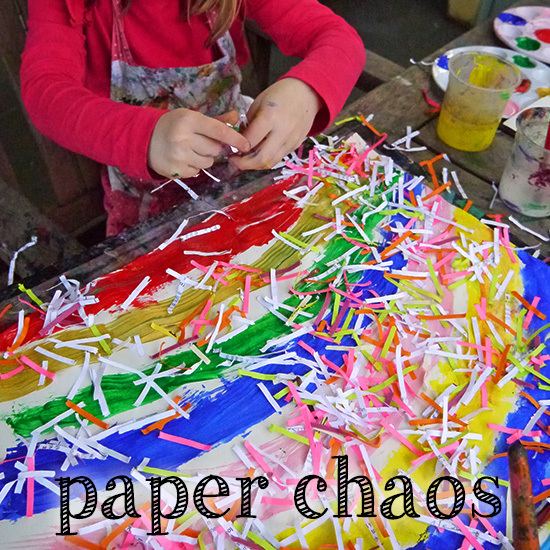 I thought that giving the kids shredded paper to add to their paintings was a brilliant idea. It was a TERRIBLE idea. That stuff goes EVERYWHERE. I am pretty OK with mess as evidenced here but this was something else entirely. To clean up I popped the kids in front of the tv and swept for 45 minutes. Totally not worth the 15 minute painting activity. Seriously... how did I think it was a good idea to give my kids a spray bottle full of watered down red paint INSIDE the house? Somehow I did, they loved it and I nervously jumped from one foot to the other watching a mist of bright red paint settle on my furniture. 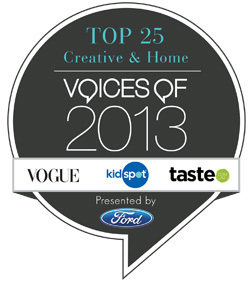 Strangely I have also let them craft with copious quantities of glitter INSIDE the house.... I think I see a pattern, I may need help! Big-time whoops! 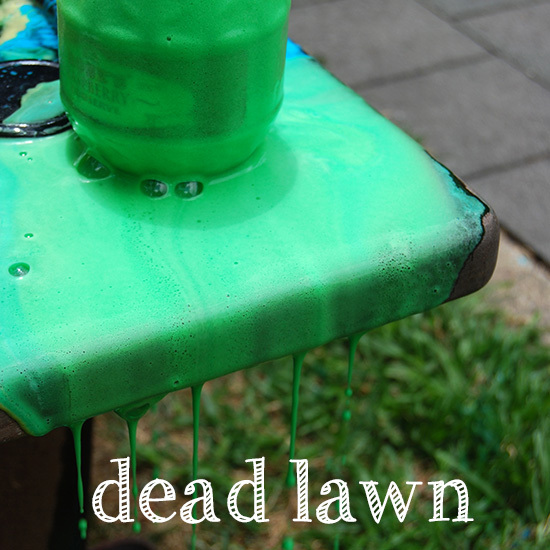 Science experiments with white vinegar and bicarbonate of soda are all good but don't do it on the lawn. It kills lawn. Poor, poor Chris who spends so much time tending the lawn and garden... I am sorry. Can't I just leave a good thing alone? Cakey and I were very happily drawing peg people and popping them into slots in a Corn Flakes box boat. 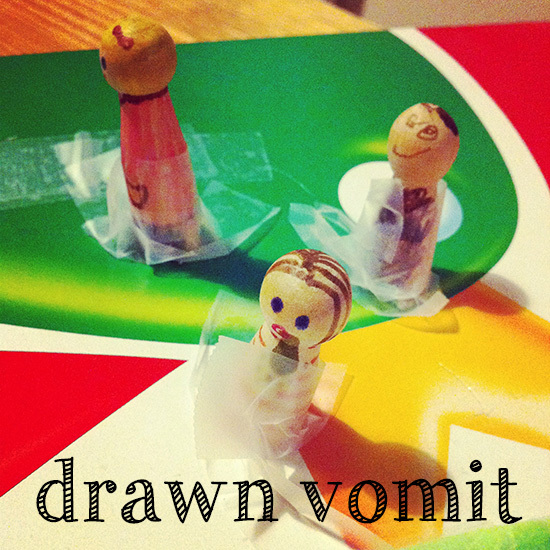 I decided to draw vomit of my peg person. I thought it was funny. Cakey DID NOT think it was funny at all.... and that ended that activity. 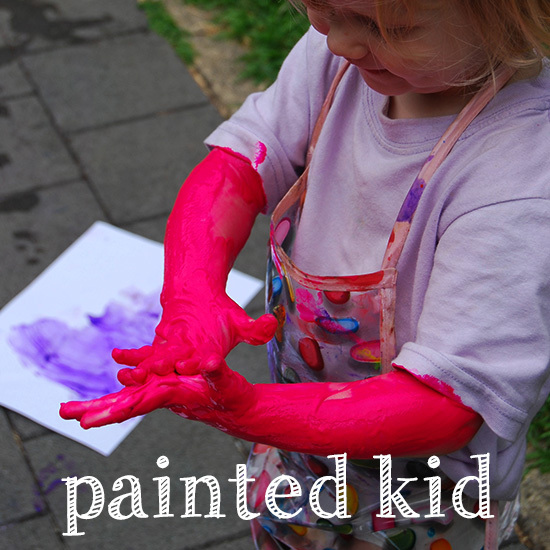 Ahhh, take your eyes off the small child with a large tub of fluorescent pink paint at hand and this WILL happen. She painted her legs too. Do you make crafty mistakes? I would love to hear about it. Yes! I was just thinking of how many great projects I've seen shared and how few "oops" ones.... I've had a few oops of my own I was going to share one day. One of them: Trying to make those yarn eggs with yarn and glue and a balloon.... NOT an activity to do with preschoolers. 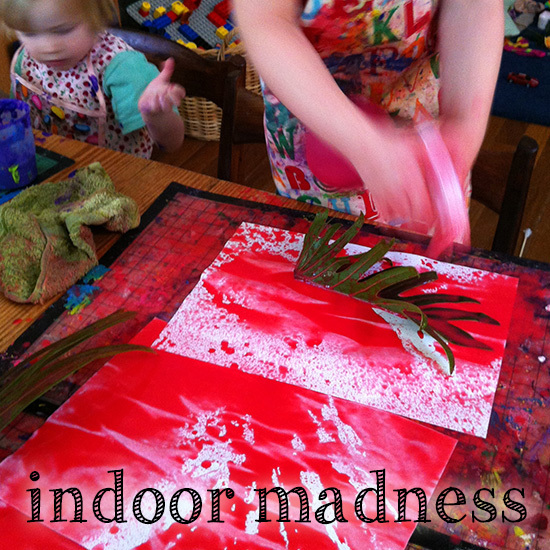 We wound up with wet, glue covered balloons and glue covered yarn all over the house. Hey Jill :) gee that sounds like unfortunate timing and very difficult to clean up. Thank you for sharing this. Now I don't feel so bad when my mess happens. Worse is the set-up and massive cleanup after a 3 minute long activity - feelie goop; finger painting; and playing with flour and water! Thanks so much for visiting, I am off to answer your question about cardboard shelving. 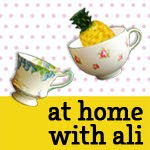 oh dear...I am still laughing Ali!! I can't believe you did red spray bottles inside...and people say I love messy activities hehe. And don't get me started on shredded paper....never, ever again here either! Just read this post and can't stop laughing. I teach Pre -kindy and I often have enormous failures. I am not afraid of trying new things but sometimes the looks on the parents faces tells me the activity is a bit out there! I laughed when I saw the bright pink kid against the pristinely perfect plastic apron. The kid's got good motor skill control to completely avoid getting paint on that thing. Good for her! 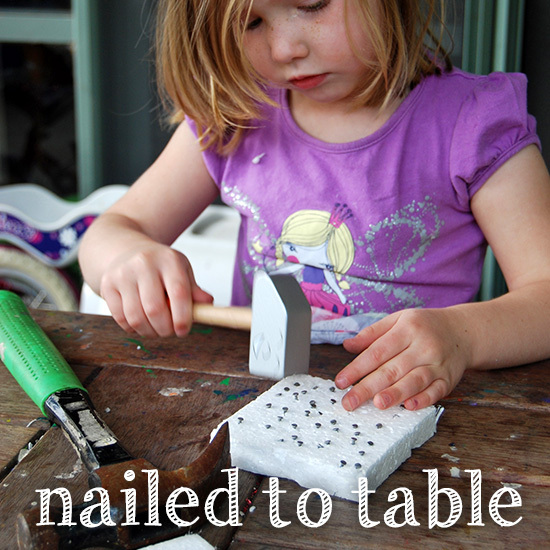 I have done the nail to the table as well!